Herman Russell’s Castleberry Hill office is close – but not too close – to the offices of H.J. Russell & Company, the mega-construction firm he started years ago that is now run by his son, Michael. It’s a quick sprint to Paschal’s, the landmark Atlanta restaurant and informal headquarters of the Civil Rights Movement that Russell rebuilt and resuscitated. And it commands a fine view of the city he helped shape – including the nearby Georgia Dome that his company built. “I’ve been in construction all my life,” he says, summing up a career that began when he went to work with his father in a very different Atlanta and blossomed as he built his own company into a major player in a changing city, with projects that include Hartsfield-Jackson Atlanta International Airport, Philips Arena and Turner Field. 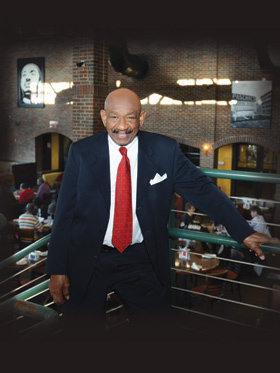 Russell, one of the new Georgia Trustees for 2013, is an entrepreneur, a philanthropist and one of the behind-the-scenes architects of the Civil Rights Movement. Hard work has been the hallmark of his life and career. He retains his position as chairman of the board. He added some high-level networking to his hard work and good reputation to land the biggest project he had yet tackled. He had worked as a subcontractor on some significant projects, including the Equitable Building, but his big break was winning a bid to become a general contractor. His work on the Georgia-Pacific Tower, completed in 1982, elevated his firm from a successful local contractor to its place as one of the top minority-owned construction companies in the country. Russell was the first black member of the Atlanta Chamber of Commerce (now the Metro Atlanta Chamber). A fellow board member was the chief executive in the region for Arthur Andersen, the now-defunct accounting firm, who also served on the board of Georgia-Pacific, still headquartered in Oregon. He had worked with J.A. Jones Construction in North Carolina so he contacted them, and the firms joined forces to win the bid to build the Georgia-Pacific headquarters downtown. “We brought that building in under budget and ahead of schedule” Russell says. “That will always be my pride and joy. It was the biggest in the Southeast.” A plaque he was presented at a special dinner celebrating the building’s successful completion is still on display in the building lobby. A photo on his office wall, taken in the den of his home many years ago, shows Russell with Dr. Martin Luther King Jr., Rev. Ralph David Abernathy and Ambassador Andrew Young. “Look at how young Andy looks,” he smiles and gestures toward the photo. In the tradition of those who dream big – and achieve big – Russell believed from the beginning that the Civil Rights Movement would be successful. Russell’s philanthropy is legendary, reflecting causes or institutions that have meaning for him. “You have to give to things that are going to improve people’s quality of life,” he says. He made other calls, as did Franklin, and they were able to raise the necessary funds. “I was proud of the fact that the King papers were going to stay in Georgia,” he says. When Russell’s wife of 50 years, Otelia, died in 2006, he wanted to memorialize her, “to do something that I thought she would like to be remembered for.” He gave a million dollars to Children’s Healthcare of Atlanta. The lobby at Hughes Spalding bears their names. Russell is now married to Sylvia Anderson Russell, president of AT&T Georgia.